Narrow Spaced Bars - Narrow Spaced "10"
A1 - The bottom gap in the backward five is relatively closed (Kai). the bottom gap in the backward five ( )(Kai). A3 - The top (horizontal) stroke of the backward five has a level to slighlty downward bias. at the end of the upper horizontal stroke (Tei). A1 - The bottom gap in the backward five is relatively open (Kai). entering the bottom gap in the backward five ( )(Kai). A3 - The top (horizontal) stroke of the backward five has a level to slighlty upward bias (Kai). 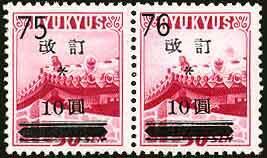 the upper horizontal stroke (Tei). 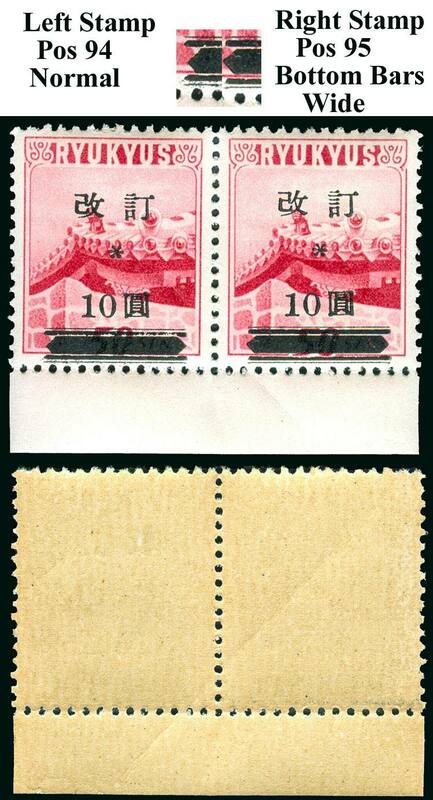 Measurements of Genuine and Forged Overprints. 16B 4.4~4.6 2.6-2.8 1.5~1.6 8.8~9.0 Wide "10"
Forgeries 16B (g & h) 4.5 3.0 2.0 8.8 Wide "10"
A1 - Outside of the Top and Bottom Thin Bars. A2 - Inside of the Inner Thick Bars. B - "1" and "0" using the Vertical Stroke of the 1. C - Bottom of the "Tei" and highest point on the Yen character. Plate Specific Variations in Scott 16A (1st Printing). 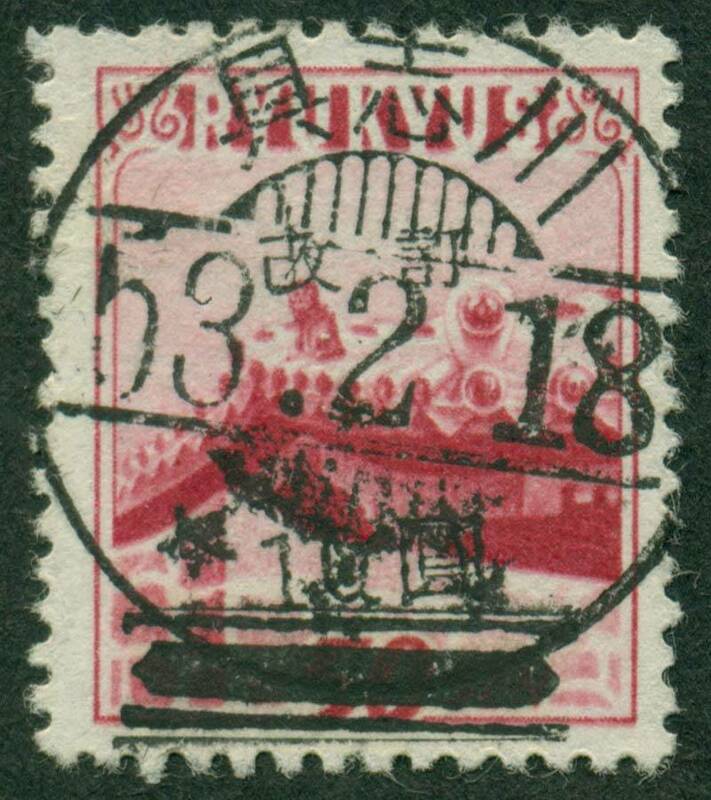 33                      Break in vertical stroke of "Tei"
33 ?? 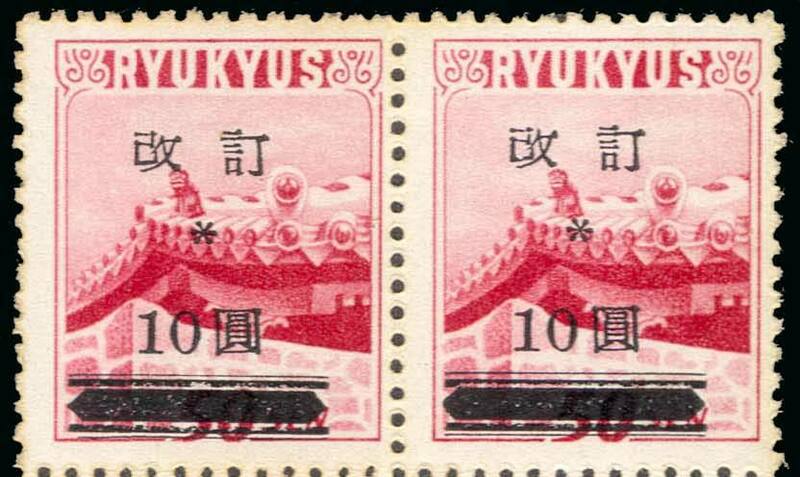 Partial break in vertical stroke of "Tei"
73                      Wrong font (small) "0" - dropped thin "0"
Gum on 16 Series Stamps. 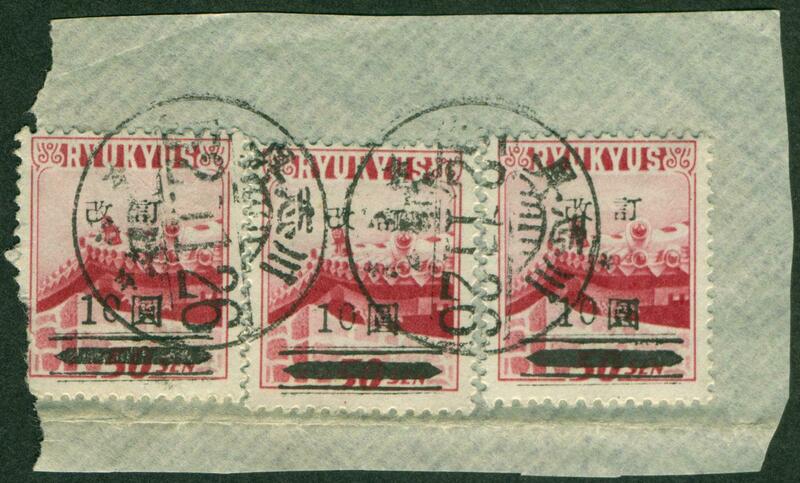 Don't expect to find 16 series stamps with nice clean shinny gum. While they certainly can be found in that condition, it is not the norm. 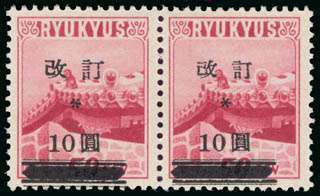 The norm for this series is a dry flat appearing gum. In some cases the gum has browned slightly. 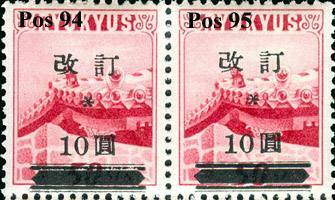 Pencil Plate Position Annotations on the gum side of 16 series stamps. 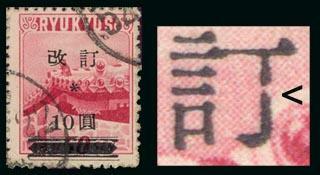 A common practice of dealers who broke up sheets of the 16 series was to make light pencil annotations of the sheet positions on the stamps. In my opinion, this adds to the value of the item rather than detracts. 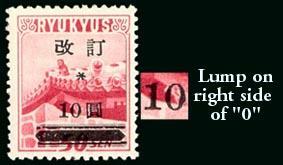 It ensures that you can quickly and accurately plate the stamp(s). 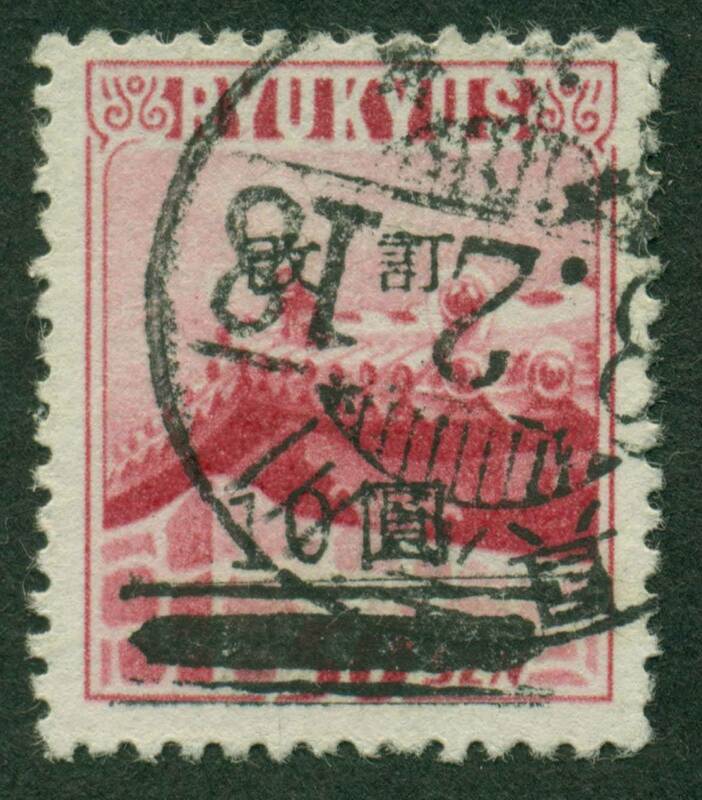 Below is an illustration of the back of a 16 series stamp which shows the dry flat gum and dealer's pencil annotation of position. Forgeries. 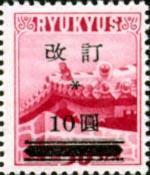 By the term forgery, I am referring to a stamp that was made with the intent to defraud the postal service of revenue. They are manufactured and used without paying the postal service. 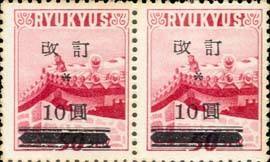 There are well documented forgeries of the 10 yen Kai Tei overprint. 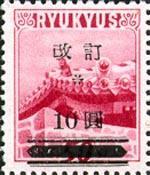 Two such forgeries are called the Gushikawa forgeries. These are discussed in From the Dragon's Den, Volume 15:2, (Whole No. 49) April, 1983. 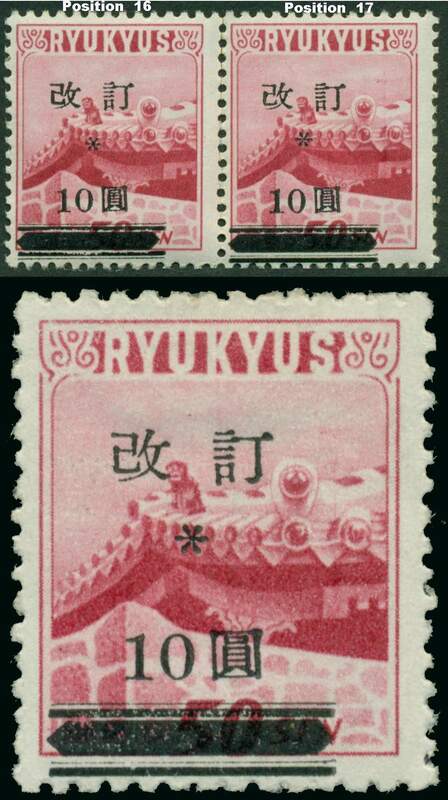 The overprints appear different than the genuine 16, 16A, 16b and they can easily be confirmed as forgeries if they have part of Gushikawa cancel (1953) as show below. Forgeries are in demand. Most collectors do not have them. 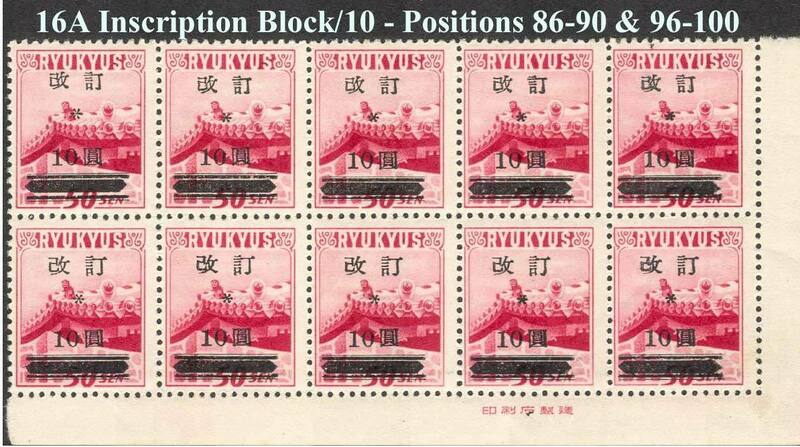 Consider yourself fortunate if you have a 16 series forgery in your collection. 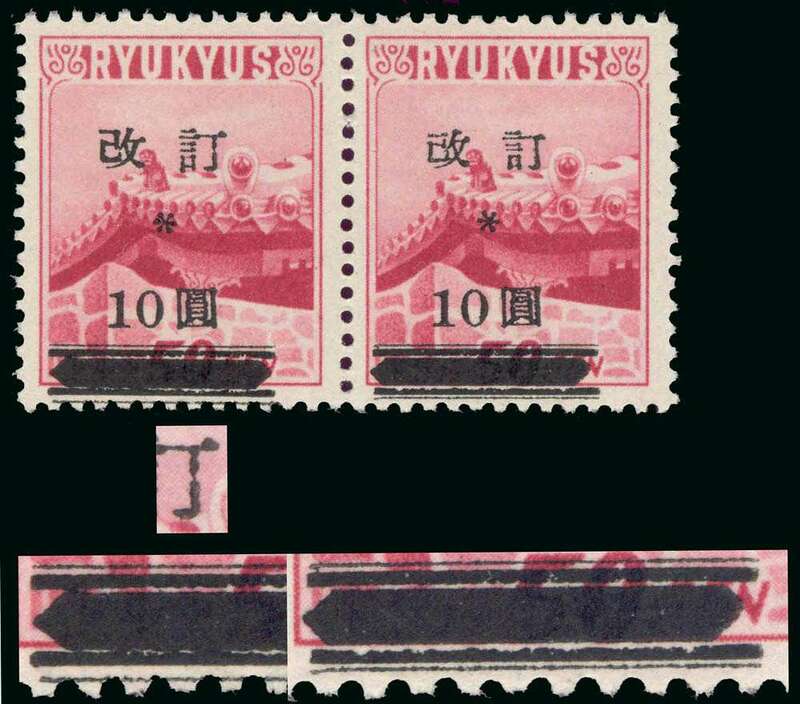 Two types of the Gushikawa forgery have been recorded (See FTDD 15:2). Type a. The first type has the large middle bar (pointed on both ends) with a pair of bars (thick and thin) above and below the center bar. 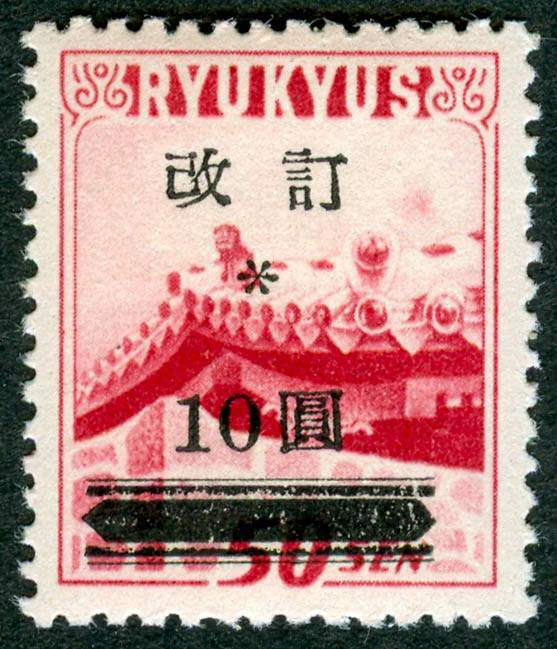 In this respect the stamp is similar to the genuine 16s with a total of 5 bars at the bottom of the overprint. 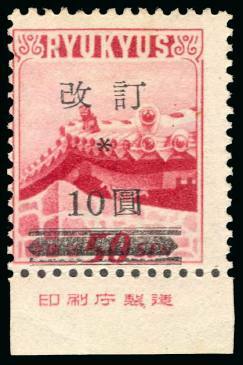 The balance of the overprint appears to have been applied separately and at times the "10" rests on the upper thin bar. The "0" in "10" is usually shorter than the "1". Type b. 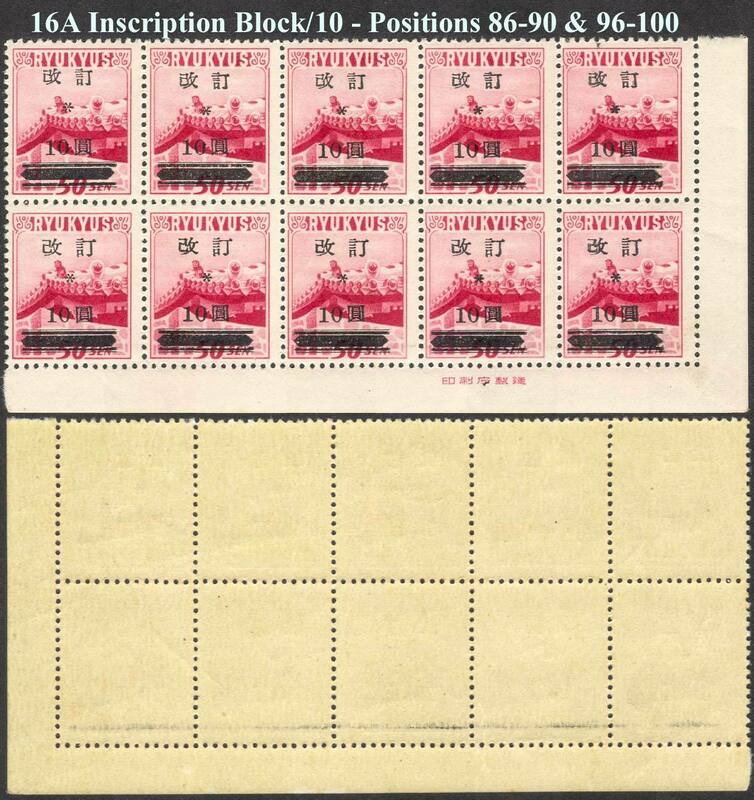 This overprint has only one thick bar above and below the large middle bar for a total of 3 bars at the bottom of the overprint. 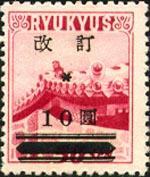 As in the type a forgery, the "0" in "10" is usually shorter than the "1". 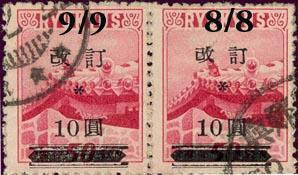 Dates of Use. 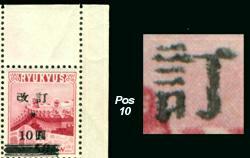 Below are the earliest and latest date uses I have personally confirmed of both types of forged stamps. 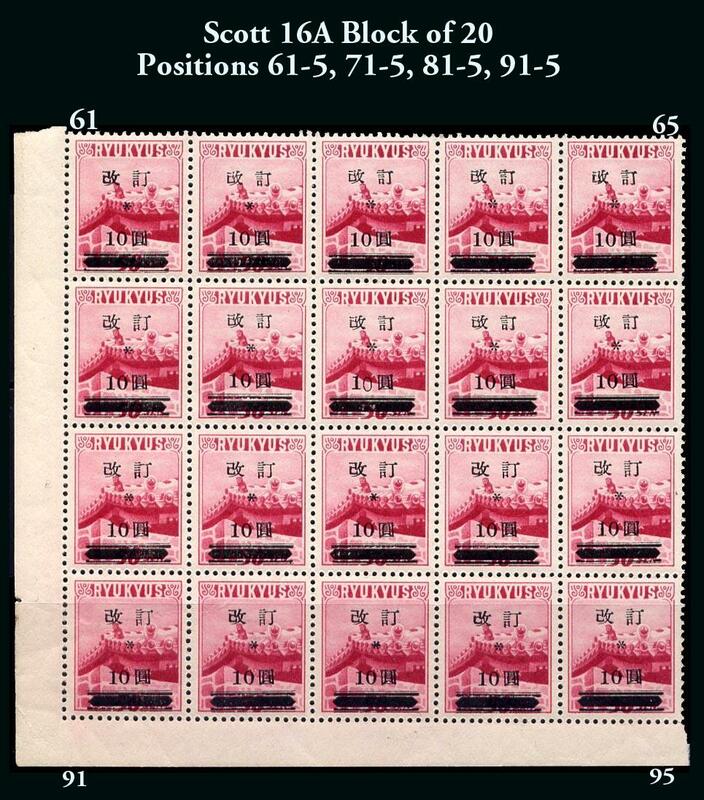 The forgeries (to defraud the Postal Agency) are listed and valued in a footnote in the Scott Specialized Catalogue of United States Stamps & Covers at the conclusion of the listing of stamps in the 16 series. The footnote advises of the two types of forgeries. 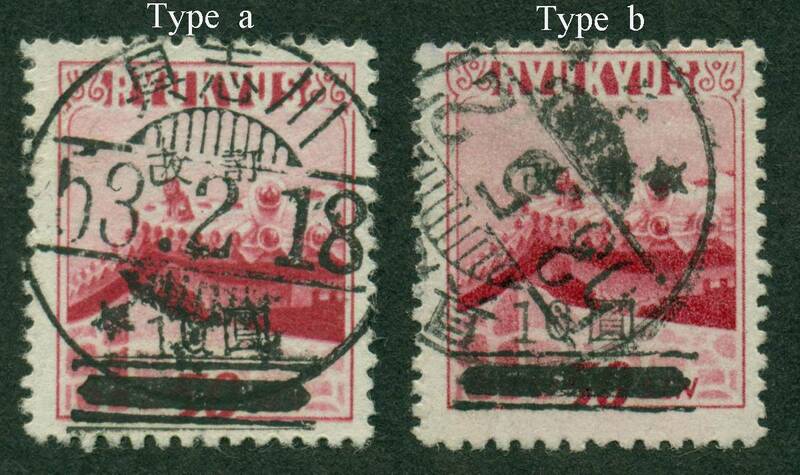 Perhaps because it is so obvious, the type b forgery is the one that I see the most. Counterfeits. 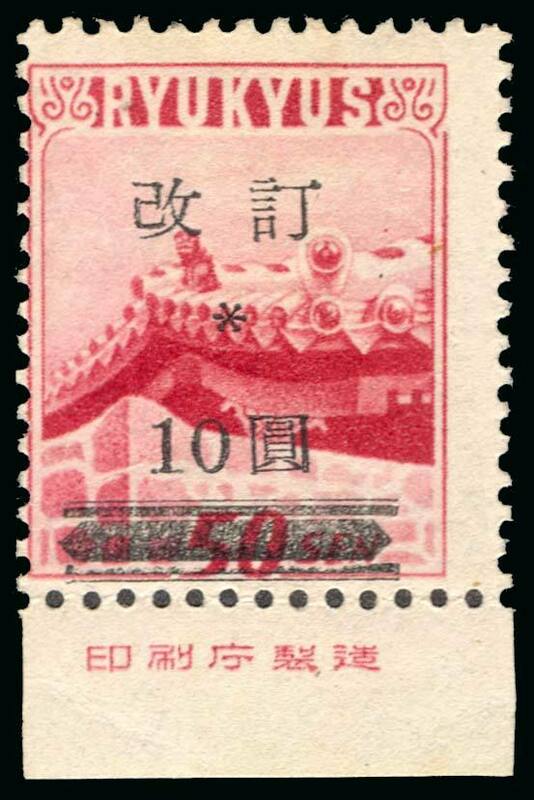 By the term counterfeit, I am referring to a stamp that was made to defraud stamp collectors. 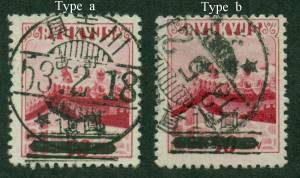 Unfortunately, counterfeits of the 16 series also exist. This is a very specialized area. The counterfeits are also discussed in the previously cited article (FTDD 15:2). My advice would be to acquire copies of all three printing that you are confident are genuine. Carefully, compare these with others and if they don't match - be cautious. 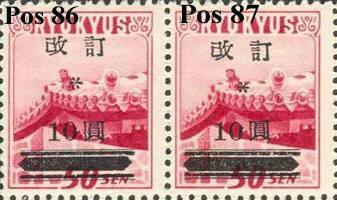 Sun Philatelic Auctions Number Ninety Four, which closed July 26, 1998, offered a very extensive collection of 16 series stamps. There was one lot of 81 counterfeits. It had an estimated cash value of $2,500.00. Covers. 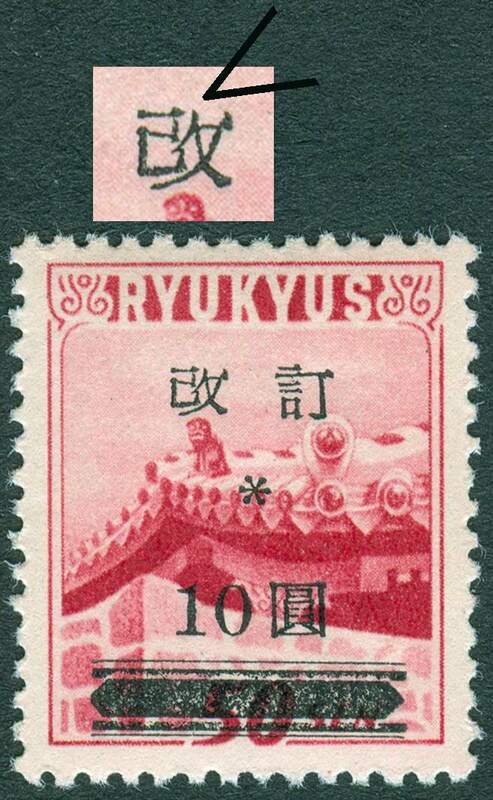 Any of the 16 series stamps on cover is an excellent item. I have a steady demand for this series on cover. If you have them to sell, please contact me.